I was going to wait and post an update after we had successfully overcome our mold in the greenhouse. However, we've been dealing with the mold for a while now, ever since we fertilized the greenhouse a few weeks back. I'm not sure if the blood or bone meal had something to do with the development of the mold, or if it was the fact that we watered two days in a row and it's been fairly cold. Either way, the mold has gotten pretty bad. We haven't watered since we fertilized (maybe 2+ weeks?) but the soil remains damp. We used a heater for a couple days, but it only made a difference of a degree or two since the greenhouse is large. 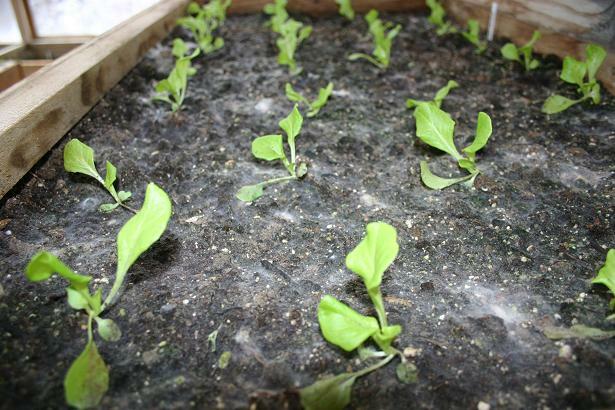 The mold around the winter density lettuce isn't too bad. But the mold below on the bibb head lettuce is starting to overtake the plants. Believe it or not, that is a slight improvement from a week ago. We've been opening the windows on days that get above 40 degrees and put a fan out in the greenhouse but it hasn't been enough. Short of investing a lot of money in getting power to the greenhouse, multiple fans and a heater, I think we just have to wait for things to dry out. We're still not giving up on trying to grow some food through a Montana winter. We've got the upstairs solarium going with a number of potted plants. Things are doing very well up here as the light is excellent and the temperature staysmoderate. At night, it gets down to about 50 degrees or so, but that doesn't seem to be too cold. In the future, I think we will try to add some shelving so that we can make better use of this space. I would love for it to turn into a jungle of different plants some day. You can see in the pictures that we've got a new addition to the house. We picked up Zoe last week from an animal shelter in Idaho. She is an 11-mo old border collie mix. She's a sweetheart who was surrendered to the animal shelter by her owners who kept her in their garage full-time. She loves being an indoor dog and cuddling with us on the couch. I can't imagine her living in a garage! She is a handful right now but is picking up basic commands pretty quickly. I think in a month that she'll be pretty well behaved. This weekend we installed an invisible fence around our acre (out in the snow!) and have been training the dogs on it. They are doing pretty good with the training and we're hoping that they can be trusted off leash in the yard in a couple weeks. 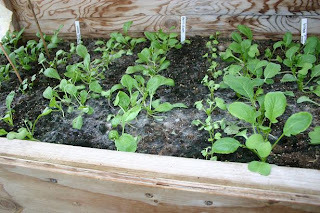 The mold issue happens to me every winter in my cold frames and under our row covers. It is caused because the ground is damp and cold and not getting enough airflow. Like you, I can not always get airflow to those plants. My solution, that has always worked well, is to carefully stir up the soil around the plants a little bit to slow the growth of the mold and then top the soil with a good half inch of very dry powdery soil. It might help, I don't bother with this, to add a little cinnamon to the mold before putting the dry soil down. Cinnamon is a natural fungicide. If you must water, try making a tea by steeping some thyme on the stove and adding the filtered concoction to the water you provide your plants. Thyme contains thymol and helps keep young seedlings from dampening off as it is a great antibacterial and antifungal agent. I try to uncover my rows this time of year but as it is always so wet out I usually end up with some mold issues. I love what you guys are doing in the greenhouse. We have had quite a few snow days but it seems to be melting pretty fast so far...I'm hoping for a couple more weeks of fair weather. Happy Thanksgiving! P.S. - We have been looking for a border collie also but are hoping to find a really young puppy that will more easily adapt to our cats...they are great dogs. Congratulations and thanks for taking in a needy animal. Maybe a little camomile tea? I've used it with success for damping off. Hey Mr. H and Nell Jean, Thank-you for that advice! We will give all of those ideas a shot - I wish that I'd posted about my mold problems earlier. There could be a couple of reasons you have mold. Wet, especially when it is cold, is usually the #1 reason. Or, you could have some potting soil with the fungus in it already. One thing you can do is run a fan. Blow it on your plants, even if you don't add heat. Air circulation is very important, so even if it is cold air moving, it is beneficial. The moving air will help to dry out your soil, too. Do you have your flats sitting in something that catches and saves water? If so, you need to set the plants over the sink to water, so they can drain. If you have Bibb lettuce that is of transplantable size, that is what I would do. 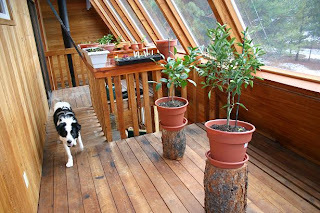 Use potting soil that is barely damp, and you can mix in some slow release fertilizer. I wouldn't use any water soluable fertilizer at this time. If you are careful, you can transplant those plants and they won't miss a beat. 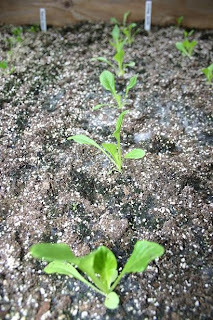 When you plant your seeds in the future, you can avoid a lot of molds and damping off in general if you will use a medium that has peat in it. I use peat and perlite as a rule. Mix it yourself, or buy soiless mix for seeds. It saves a lot of trouble. Good luck with your plants. Cute dog. I bet that is a smart one, too! Thanks for the advice Janie. As far as transplanting goes, those are the beds that the plants will stay in. The bed with radishes are about 6 inches deep, but everything else is 1.5 feet. The soil has a good deal of peat and perlite in it right now. We're trying to grow some food crops in the greenhouse over winter. 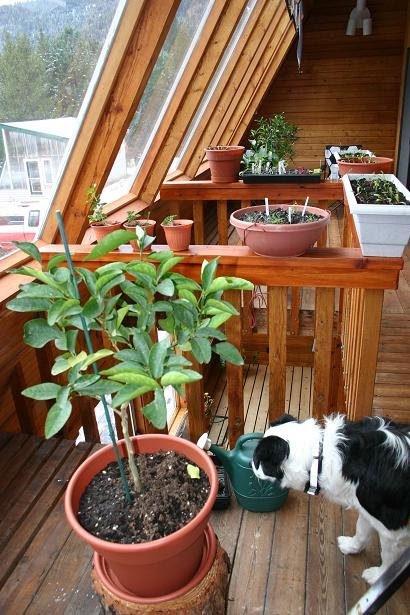 In the spring we'll be using the greenhouse to start plants to transplant. I think you're right about our cause of mold being the cold and damp weather. We'll keep putting the fan out in the greenhouse and someday add heat. I have been debating starting plants this winter, but the only space I have is in my basement - and I'm afraid that the soil will get moldy from being down there. I will try some of these tips and see what happens. Good luck with your problem. I've had peat go moldy too, but I have heard cinnamon is supposed to work. I wonder if a vinegar mix will work. Vinegar is a herbicide! It will kill your plants! Good luck with your growing attempts, and good for you for trying! Your dog looks great. My friend Carol adopted a deaf border collie, Angel. Great dogs.